From the vantage point of the 21st century, it's hard to imagine how much a nickel could buy in 1892 Phoenix, Arizona, when the first electric trolley cars were built. 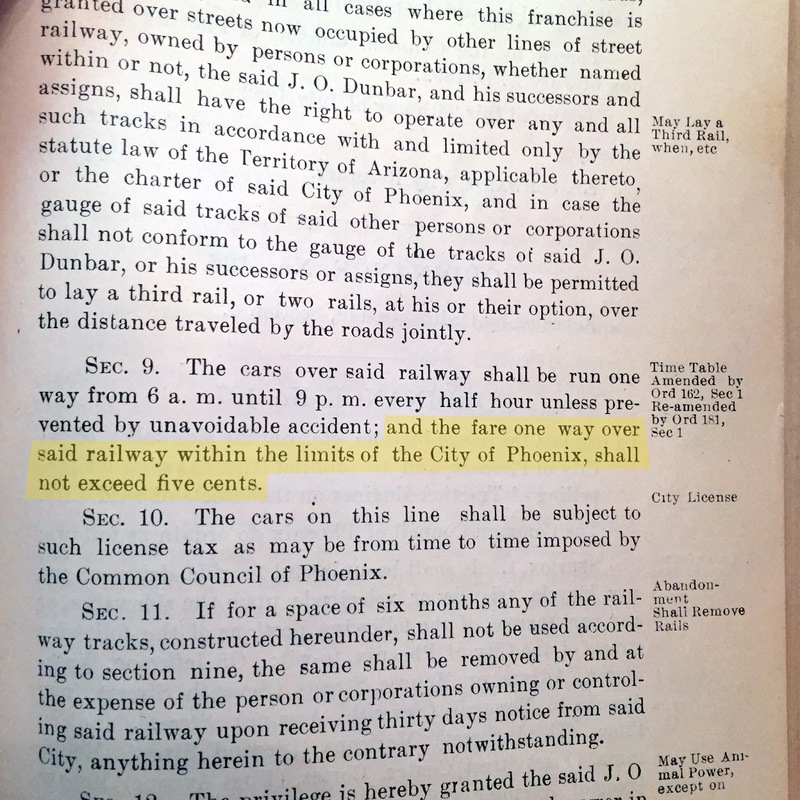 And the Common Council of Phoenix stipulated, among many other things, that the price of the fare of a street car would never exceed five cents, for fifty years. In 1892, you could get a "shave and a haircut" for two bits, which was twenty-five cents. You could buy lunch at a restaurant for a nickel, and have an extra penny for a tip. By the 1940s, a nickel could buy you a bottle of Pepsi, but not much more. In other words, fifty years of inflation between 1892 and 1942 spelled bad news for the street cars. Just like the Red Cars of Los Angeles, the street cars fell into disrepair. Everyone was happy with the five cent fare limit, except the people who had to run and maintain the system. They scrambled for money, and in Phoenix, when the fifty year mark was hit, the street cars remained in operation throughout World War II, and then were abandoned. It's not a conspiracy, man. Back in 1892 a nickel fare sounded like more than enough. And fifty years was so far in the future that no one imagined that it would ever come. But it did. And without the flexibility to increase the fare (which was stipulated by law), the trolley cars became a mess. If all you've ever seen are the beautifully-restored cars at museums, you need to talk to people who actually had to ride those things in the 1940s. They were harsh, dirty, and definitely with no air conditioning. In Phoenix it must have been awful, and even in Los Angeles I would imagine that people riding street cars cast a wistful eye at the cool comfort of the modern cars and buses going by. 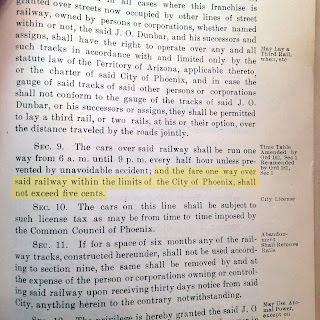 Image at the top of this post: Page 149 of the Ordinances and Resolutions of Phoenix, 1896 edition.